The Spider Planet series has not aged well. On the other hand, Cloud Atlas also had a white guy playing an Asian guy, so…we haven’t progressed much in the 40 years since then? It’s a shame there’s so much racism and sexism in these, as they’re the last John Pertwee series, with a storyline that carries over a bit into the Tom Baker era. Besides the casting, there’s the, spoiler, Tibetan who is really a timelord who has the answer to everything, the othering and appropriation of Buddhist meditation, and the familiar all-white future of humanity. Someone actually says something like, stay home, this is men’s work. Also, for some reason this episode made me really want to know why only women are wearing skirts in the future. It seems as likely that both men and women wear skirts, no one wears skirts or only men wear skirts, but somehow it’s always women. Why? My favorite scene–gesture really–comes near the end when the doctor admits he didn’t think of taking the blue crystal from Metebelis 3 as stealing. He touches one finger to the corner of his mouth and his face is full of rueful acknowledgement of his faults and it’s just kind of amazing. He already knows this is the end of this incarnation and it’s there in his face. 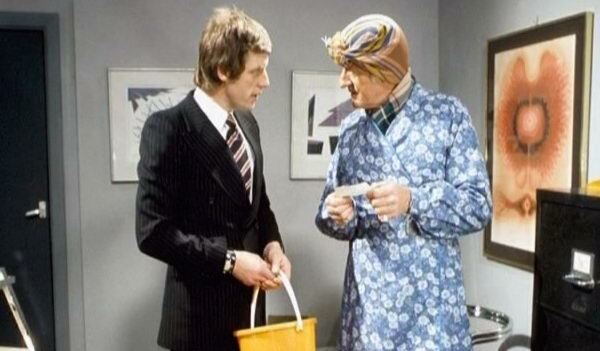 Pertwee and Baker have always been my favorite doctors. Looking back it’s because they are older and their faces are full of that life experience, and expressive of it. And the clothes. Pertwee had panache: velvety jackets, frilly collars and cuffs, great capes. Baker had a schtick, always in the coat, hat and scarf. As a kid, the scarf delighted me. I’m looking forward to see what Peter Capaldi does with the doctor. In other news, I will never be done writing my synopsis. And writing my synopsis might lead to re-writing my query letter and then I’ll never be done with that either. Sigh. I really would like to be writing a novel again. By the time you read this, I’ll be on a writing retreat. Writing. I hope. I’ve been watching some classic Dr. Who to remind me of what I used to love so much about the show. I’ve pretty much hated new Who since Donna. Why did she have to be assertive and screechy? Why was the fact that she was not-typically attractive linked to her not being romantically attracted to the doctor? (Unlike those more conventionally attractive companions, who were blond or slim and feminine even while saving the world and disgustingly infatuated. Please.) And finally why the hell didn’t they let her die the hero’s death that she wanted instead of consigning her to her dead-end hopeless life where she didn’t even have a memory of all she’d become? In other words, I stopped being able to ignore the writers’ and producers’ misogyny. And it’s only gone down from there, until each episode of new Who is a torture of waiting for the moment I, as a lifelong female fan of Dr. Who, will be betrayed. I keep watching, hoping they will prove me wrong, and they keep meeting my low expectations. Sometimes I think the writers of new who think they’re writing for The Highlander: There can be only one! No one can be as smart, resourceful or interesting as the doctor and there certainly isn’t any space for another timelord any more, even when the convoluted logic of the show would allow for it. Like that episode with the doctor’s daughter–they killed her off real quick didn’t they? And don’t even get me started on Clara. It’s the wasted potential that gets me the angriest. Take The Green Death from 1973. It was produced either just prior to or smack in the middle of the 1973 oil crisis and during the economic uncertainty of the decade. The series takes place at the site of an old coal mine in Wales, where laid-off coal miners are protesting the loss of their jobs. Concern about fossil fuels, unemployment and problems with the economy sound familiar? The facility is being used for a new oil refining process that is being touted as clean and having minimal waste byproducts. UNIT is called in to investigate some suspicious green deaths, and ultimately is ordered by the prime minister to protect the site/blow up the mine, against the advice of scientists, to contain the infection. Profit and productivity are king, with death, pollution and the environment afterthoughts that can be cleaned up later. Sounds a lot like today’s fracking. It especially echoes the current situation in Balcombe, England, where the government has spent hundreds of thousands of pounds of taxpayers’ money for police to protect the energy company that is conducting fracking from…taxpayers. And where fracking is touted as clean and having minimal waste byproducts, while meanwhile it is poisoning our ground and water, and using up clean water and creating shortages. There are also the “kooks” who believe in alternative energy sources like wind, solar and tidal energy and who are protesting the pollution and destruction of the environment. Change a few words, and The Green Death isn’t about the 1970s oil crisis; it’s about fracking and 2013’s struggle between climate change deniers and everyone else. We have made some progress in the acceptance of alternative energy sources and the idea is no longer so fringe, although it is not by any means mainstream. What else hasn’t changed? The misogyny. I was probably too steeped in the 80s brand of misogyny, or I just didn’t want to remember, the patronizing treatment of Jo, by the doctor and everyone else. Surprisingly, the brigadier seems to treat her as an equal more than anyone else. (Although thank god female actors aren’t expected to whimper today as much as they were in the 60s and 70s, especially the young ones. How did they even stand themselves? And did all that really make men feel manly?) All the men talk down to her, and she plays scatter-brained blond for them and offers to fetch them coffee. No doubt her mother told her men don’t like smart women. And the doctor engages in underhanded manipulation the equal of anything under Moffat, when he tries to prevent Jo from making her own decision about leaving him for the “kooky” professor (who totally has the same 70s haircut as Jo). But actually, is the misogyny the same, or is it worse? I’m jumping back and forth between the Pertwee and Baker eras as episodes sound interesting and not in any particular order. In my head cannon, audiences loved Sarah Jane Smith because she had agency, and Ramona, in both her incarnations, was supposed to keep an eye on the doctor–and was just as smart and resourceful, and of course was a timelord herself. Oh, does anyone know if those are real Welsh accents? I could understand them remarkably well but I can’t understand a thing Stacey on Gavin and Stacey says. And I just love the doctor’s pride in his cross-dressing talents. Complete with spoilers. You were warned. I’ve been sick. I’ve been watching a lot of TV. So Twitter friends told me about Call the Midwife and for the most part I find it fascinating. You don’t get too many TV shoes that focus so exclusively on women’s lives, and while there’s at least one baby born and delivery scene per show, there’s so much more. I particularly like that the main women characters are friends. I know, what a novel idea! Women! Can be friends! On TV, just like in real life. Some of the minor characters have rivalries and are catty, but in about a proportion that’s way more true to life than most depictions of women’s lives. And the childcare, childbirth, reproductive options and economic situation is fascinating. In a lot of ways, it seems like the 1950s wasn’t that much different from any of the centuries that came before in terms of giving birth (although sanitation and penicillin are no small miracles). In other ways, it’s clearly a time of transition, where old ways and new technology and new ways of thinking are butting up against each other, sometimes clashing and sometimes co-existing. A lot of times I want a running commentary on the science–like we don’t treat pre-eclampsia this way anymore, or we now know that’s a myth, or the fatality rate from TB was such and such. I’m also constantly wondering how much has been dramatized for the program and how much is based on the memoirs of the Jennifer Worth. I guess that’s what the book is for. I think we often think that our time has a monopoly on certain kinds of social situations, and shows like these make us see that isn’t so. I’m thinking of the white woman who had a one-night stand with a black man and had a black baby in the extremely white London neighborhood. Or the twin sisters living with one man. In a marriage? It’s not exactly clear. Or the sister and brother who possibly have an incestuous relationship that the nuns know about and look the other way. OTOH three episodes of Call the Midwife really pissed me off. The first is the one with the story involving a white woman’s affair with a black man and subsequently giving birth to a black baby. CTM is extremely white. I’m willing to give it some leeway for time and place yada yada, while acknowledging this is probably white obliviousness/privilege, both past and present, and laziness on the part of the producers. What I am not willing to forgive is only having black extras for this episode. If, going forward, they had continued to include black extras it wouldn’t have bothered me quite so much. But it is so incredibly egregiously messed up and racist to have one episode with a slightly more diverse cast and then to go back to white, white, white everywhere you look. OK, crap, the second one totally fell out of my head. Some other time then. The third is the abortion episode. I was both surprised and not surprised that there was finally an abortion on the show. After all, abortion, illegal or otherwise, is, has been and probably always be a fact of women’s lives, whether the government, the media and men want to acknowledge that or not. It actually wasn’t too terrible–except for the framing. The voiceover at the beginning, older Nurse Lee, says something like I wish that I could say all the women were brave and all the women were happy. And then in opposition to this we get the woman who desperately wants an abortion because she already had 8 children. Basically, CTM is telling me that this woman is not brave. Well f** you, CTM. Any woman who knows that she is at the end of her capacity with 8 children, who knows what she wants and goes after it in spite of the opposition of sanctimonious Nurse Lee, the public health system, social mores and the law IS a hero. And it is definitely not her fault that her only option is a woman without the training or compassion or something to give her a sanitary illegal abortion. Plus the plot didn’t make sense. One minute the woman is in a coma and her children are kissing her good bye, and the next she is miraculously recovered because they got a new flat outside of London and she can gallivant through the fields? How does that work if she was in the hospital? Still, I was happy they didn’t kill her off to punish her for daring to have an abortion. I hope that they do more abortion episodes in the future. Was there any British equivalent of the Jane Collective? In The War Games from 1969, the last serial of the second doctor, the sonic screwdriver is just a screwdriver. In fact, the Doctor uses it demonstrate he is from the future, by loosening and tightening a screw without touching it. Last episodes to be filmed in black and white, as well. What with the holiday season and deadlines at work, I probably won’t be blogging too much until the new year.